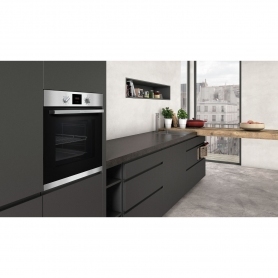 The NEFF B1HCC0AN0B is a great choice for any kitchen. Coming with a wide range of programmes and an integrated grill, you’ll be able to cook all types of dishes to perfection. Use the CircoTherm® function to bake and roast multiple dishes simultaneously – over three levels. This unique fan technology also helps food to retain moisture, and even limits flavour transfer. Although this NEFF electric oven is a single model, with a net capacity of 71 litres, you won’t be struggling for space. And, with a fixed integral grill, the B1HCC0AN0B can brown and crisp foods to give them a new lease of flavour. 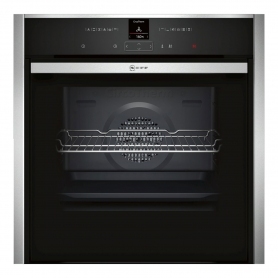 You’ll also find fan assisted cooking in this electric oven, to give you an even bake on every sized dish. From light sponge cakes to succulent Christmas turkeys, you’ll achieve top results every time. 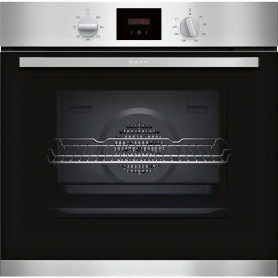 Rated ‘A’ for energy usage, this NEFF built-in single oven is also energy efficient, helping you save on utility bills. The B1HCC0AN0B comes with useful features to make your life easier – starting with the built-in electric clock timer. Keep an eye on everything you’re cooking, and never risk burning your favourite foods again. You’ll also find an LED display which is easy to read and user-friendly. Find cleaning your oven a difficult chore? 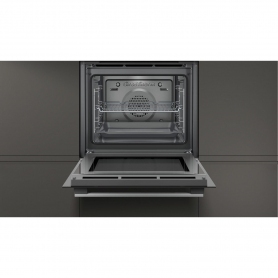 NEFF’s built-in single oven door is removable, so you can keep your appliance looking spotless with ease. The smooth enamel oven lining is designed to facilitate cleaning too – saving you even more time and effort. 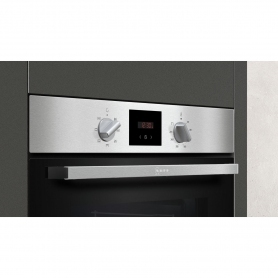 The NEFF B1HCC0AN0B is a versatile oven, and with five different cooking functions, you’ll be able to serve up a range of fantastic dishes. Add one to your basket now. We accept the following payment methods.